Best Chinese Knives: Fura Small Ti Flipper Cleaver Knife Review! Fura Small Ti Flipper Cleaver Knife Review! So I have got this knife as well and would like to share my thoughts about it. Shipment took a bit more than 2 weeks from China. The knife came in a tin presentation box, good safe packaging. - It was a bit gritty and dry, so didn't flip well. One drop of lube on the detent ball and a bit of WD40 in the bearings sorted out this problem. - The pivot screw was sharp. Few strokes on the #600 grit diamond stone helped make it pleasant to touch and even better looking IMO. Other than that it came sharp and no additional issues. - The looks. There is something so cool about small ti flipping cleavers, the frag pattern, bronzed standoffs, embossed cone pivot and the blue anodizing add to the unique design and appearance. - The action. After the lubing and breaking in it became super smooth (runs on bearings) and flies out (but the detent is still strong). - The deployment options. Could be open by a flipper, flicked out on the thumb studs with a thumb, opened smoothly with the cutout and even flicked out with the middle finger. 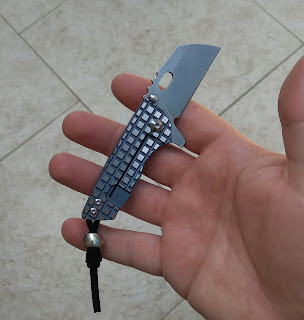 - The ergos - surprisingly good (with a lanyard). Gimping is excellent. - Small size, slim profile and is pretty light. - Price. If this was made by any brand - it would cost 5x times at least. - Comes without a pocket clip. - No steel insert on the frame. There is a bit of a lock-rock sometimes when not holding the knife in hand (like on the older Striders), but the lock holds well and won't fold. 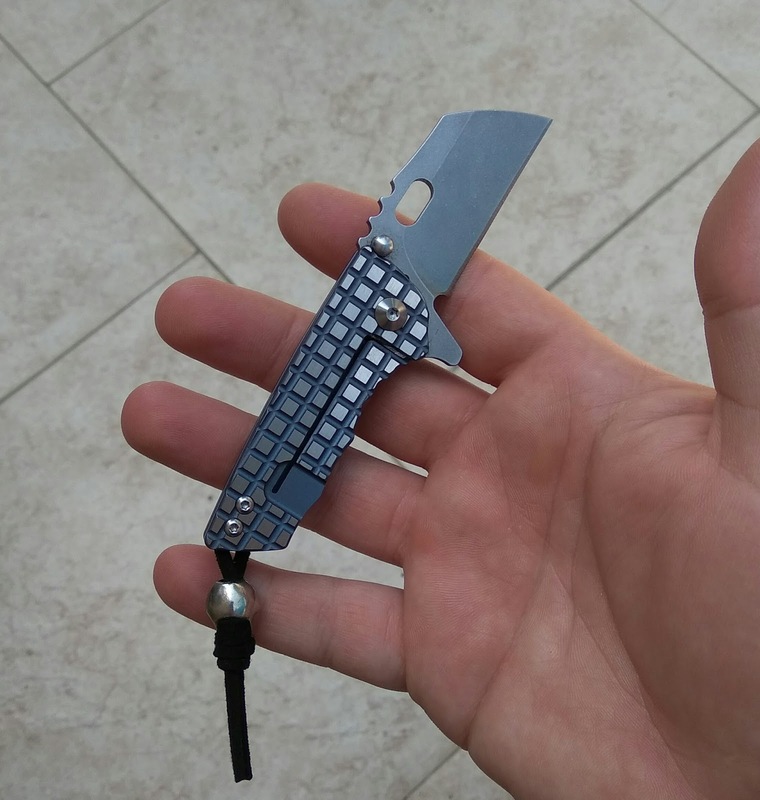 Summary - overall it is a very cool small novelty flipping cleaver, that will fill that void in your collection and your heart. It is a people friendly knife (my spouse thought it was very cute) and a great conversation starter. I'm very glad I got this one. Atech, I really enjoy your reviews and contributions to the community. 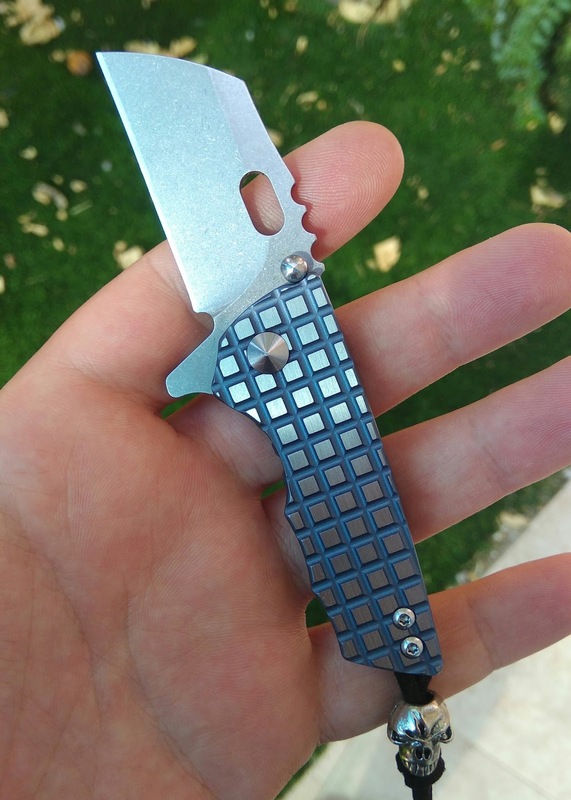 I am looking for a Shirogorov 111 homage knife (no markings). I went to your recommended sites and can't find one, and the ones that I've seen that are comparable, are no where near the 111mm length of the original. Your help is much appreciated. About the Shiro 111 homage - the ones I've seen and had all had a shorter blade than the original (about 93 mm). Check out the new Sigma clone - it has similar construction but looks pretty cool IMO. Thank you for your quick reply. Keep up the great work!